I have been remiss in updating this thing, even for Christmas and the New Year. It has been a busy time, but also, it seems that there is nothing exciting to write about. Continuing on writing about another transmitter installation or studio project seems redundant. That being said, I have moved into the realm of high quality audio. I miss that days when a good audio was the general rule, in both home audio and broadcast. People have become used to crappy .mp3s played through crappy computer speakers or cheap ear buds. Knowing just enough to be dangerous, I figured I should do a little bit of research before spending a lot of money foolishly. I discovered that there are gobs and gobs of information on various forums and other places around the intertubes. Most of it seems to be good, although one has to be careful and backup whatever is out there with science. There are several books about DIY speaker building, amplifier construction, turntable maintenance, etc. 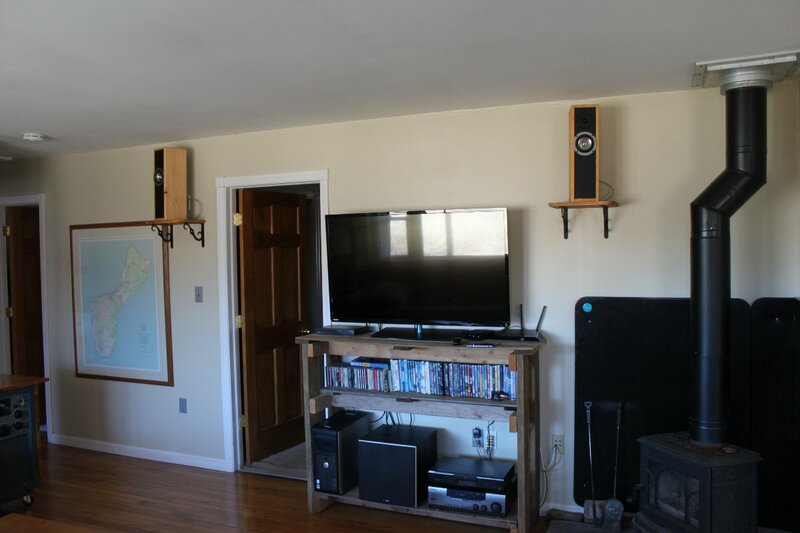 Picking the thing that I thought would be easiest and lead to the biggest improvement in my own audio system, I set out to build a pair of speakers. 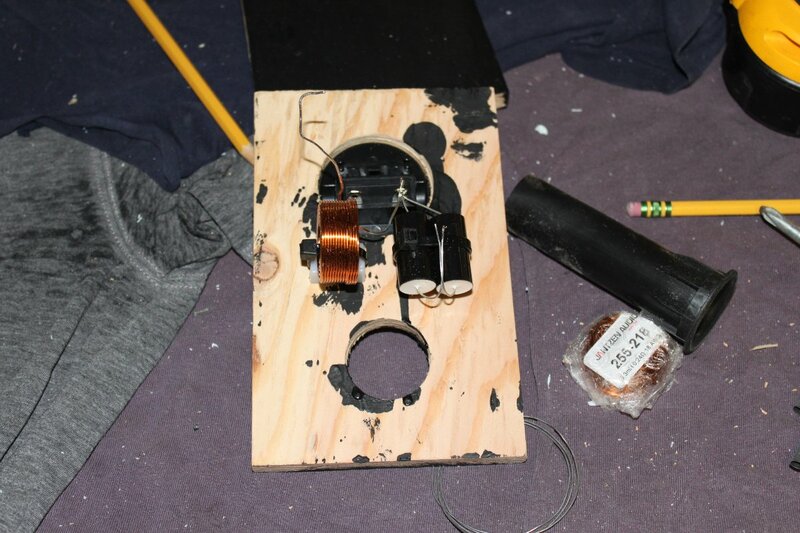 Most people probably don’t realize this, but there is quite a bit of work that goes into a well designed pair of speakers. I began by thinking about what the end use will be, which eventually is a single ended tube amp based on a KT88 design. As such, I figured the efficiency of the drivers was an important detail. Power handling capability of the driver could be quite low, 30-50 watts or so. Searching through several speaker manufacture’s web sites, I found a small sized, full range driver that is fairly efficient and has excellent reviews. The Tang Band W4-1337SDF has a published sensitivity of 89dB/1 watt/1 meter. Its frequency response is 70-20,000 Hz. It also has a titanium speaker cone. There have been many an article written and much ink spilled on metal cone speakers, so I did not quite know what to think of the titanium cone. I did spend a goodly amount of time reading all of the reviews on this particular driver and decided to take the risk and buy two of them. 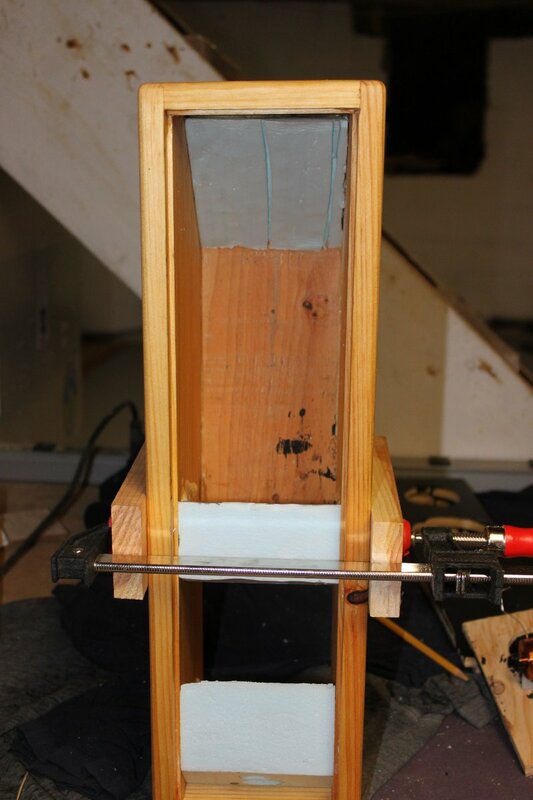 Next step was to calculate the proper interior volume of the speaker enclosure for a vented box. Vented or ported speaker enclosures are generally more efficient than sealed units. 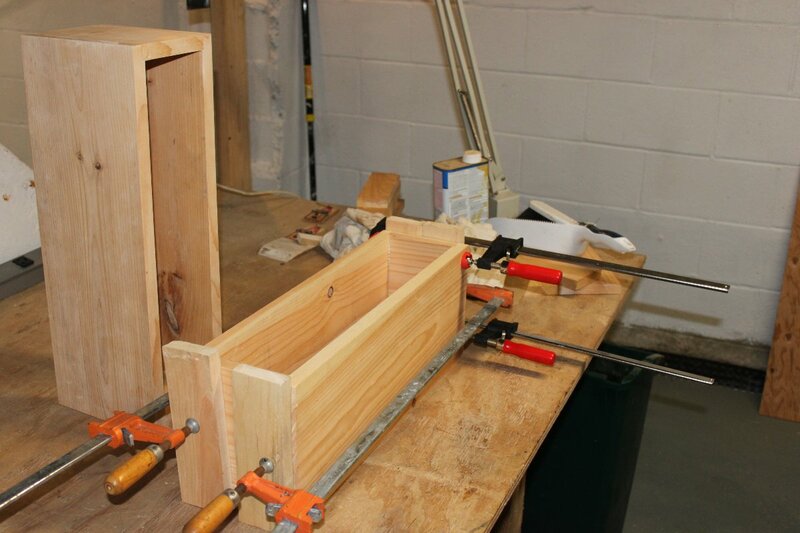 Vented boxes are a little bit more exacting to build correctly. Again, lots of information available on line, some of it is good. In the end, I downloaded a free software package called WinISD. WinISD takes into account all of the Thiele/Small characteristics of the driver and generates a basic box design. I looked at the proposed box and decided that the internal volume was the important part, the actual shape of the box is secondary so long as it is not an exact cube. Instead of the 2:3 ratio rectangle, I choose something different; a 1:4 rectangle. Next, I began looking around at available materials. 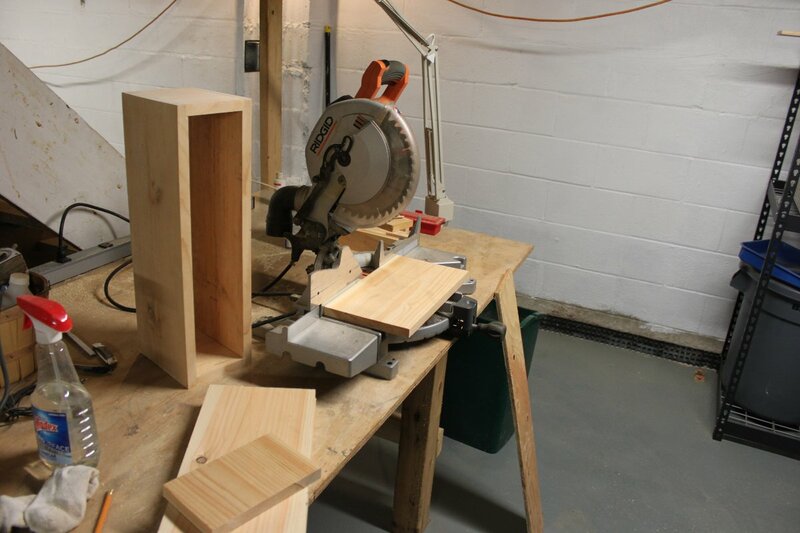 I have plenty of wood laying around from previous projects, so I decided to make the boxes from 1×6 clear pine. This is also contrary to conventional wisdom, as MDF is the preferred choice in speaker cabinets. This is because natural wood has a resonate frequency, which can create problems. As these are low power units, I figured, if it was a huge problem I could always make another cabinet out of MDF. In the mean time, the wood, glue, paint, screws, foam insulation, tung oil finish where already in the shop. Why buy more stuff? Thus, parts ordered, I started working on the boxes. I decided that rabbit joints where a better choice than mitered 45 degree joints. 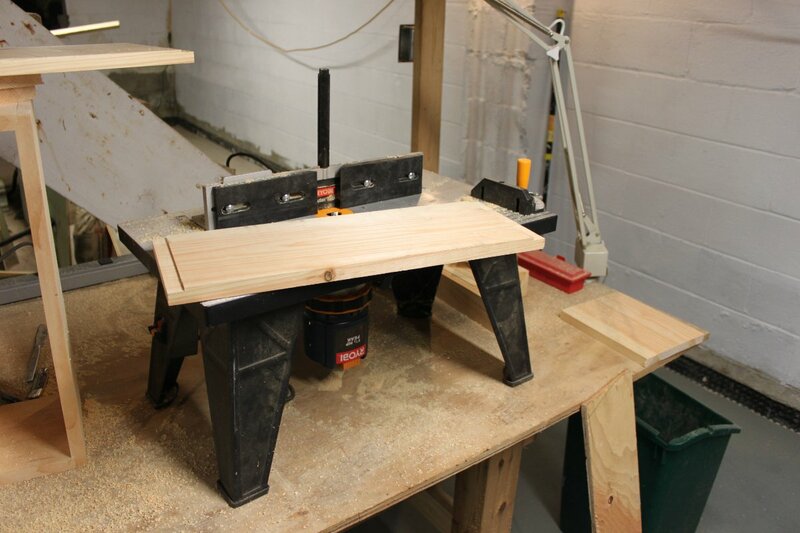 I used the router table to make the joints, cutouts and round the cabinet edges. During the sanding process, I discovered that the wood boxes do indeed resonate somewhere around the 300 to 400 Hz region. More on that later. The fronts and backs are made out of 1/2 inch plywood, painted flat black. There is a one inch rear firing port. The box itself is larger than what is called for. I made it thus because there where a couple of different recommendations on box volume and I wanted to add some cross bracing, which takes up space. I thought about ways to dampen the wood box resonance and came up with a bit of rigid foam insulation, again left over from some long ago renovation project. My idea was to take up some of that excess internal volume, but they might also work to dampen the resonance. I cut several pieces of this material so that they fit snugly into the box. I then used the sander to resonate the box and see what effect the foam insulation was having. In the end, I came up one piece at the top and bottom and one approximately in the middle. Once I was happy, these were glued in place. This significantly dampened the resonance. I also added quite a bit of acoustical foam inside the box. The cross over is designed for 4000 Hz. It consists of a 5 uF capacitor and a .31 uH inductor. I am a minimalist at heart. I thought about nixing the inductor altogether, but I think running both the driver and tweeter at the same time would lower the impedance too much over the high frequencies. The Tang Band driver is resonant at 60 Hz or so. 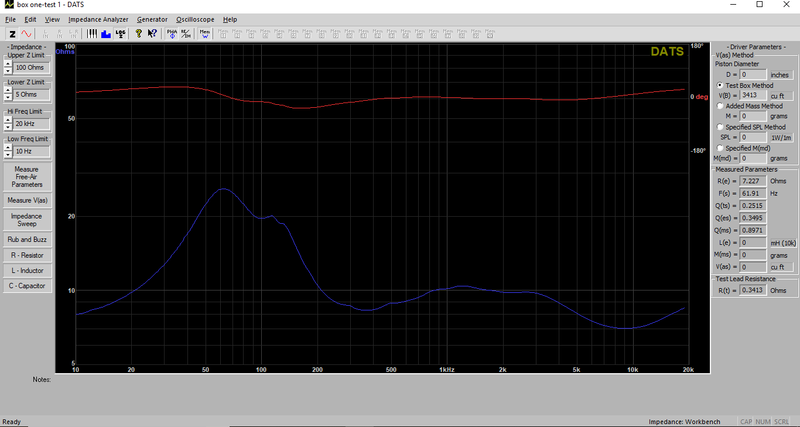 After the F3 frequency, calculated to be 101 Hz, the impedance looks good all the way out to 20 KHz. It appears the F3 frequency is slightly higher, likely because the port is too short. I messed around with the internal box volume by adding and taking away pieces of foam insulation. In the end, I found that the original volume calculated by WinISD worked (and sounded) the best. I set these up and took a listen. Using a reference recording of Tschaikovsky (piano concert #1, B flat minor) I found these speakers sound excellent. The stringed instruments and horns in particular sound very detailed. The piano is open and natural. If I close my eyes, it sounds like it is right in front of me. Perhaps that is the wood box. I tried them on several different types of music; jazz, rock and even Tom’s Dinner. 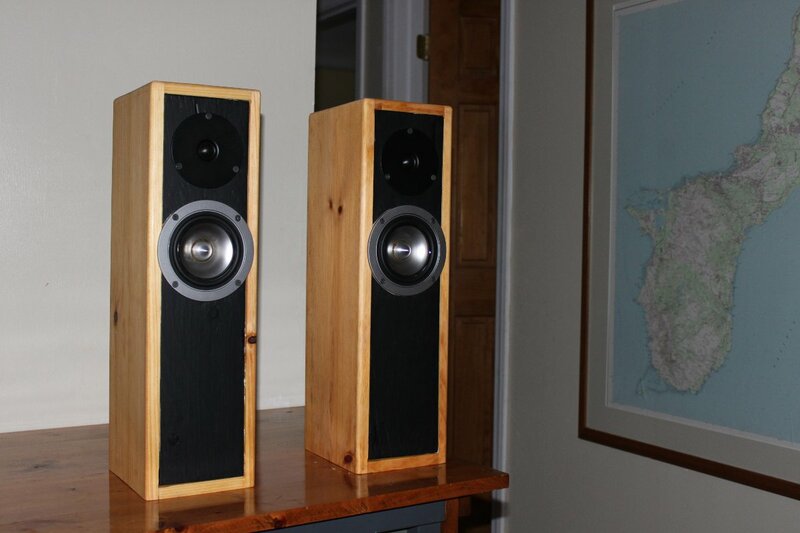 It may be a bit biased, however, I find these speakers to be far and above anything else I have owned in the past. They sound great. My only very minor gripe is the bass is not as responsive as I would like. The low end starts around 90 Hz. This showed up in the F3 frequency reported by WinISD. I have a Polk Audio subwoofer that I am using (temporarily) to add the bass back into the mix. I could also try tuning the ports a little bit to move the F3 down. That may also require removing some if the foam from the box to increase the internal volume. I also made a small mistake when cutting the wood for the box, as they are slightly too narrow and the driver does not fully fit onto the plywood front. That is because I started working on this before I had the drivers in hand. If I make another pair, I’ll make the cabinet a little bit wider. 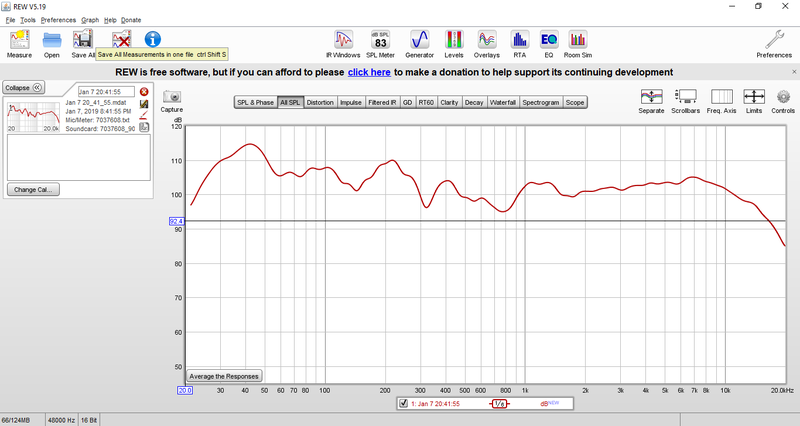 I also ran a couple of sweeps with Room EQ Wizard. That 300-400 Hz box resonance shows up in the sweep, but it is not noticeable when listening. Without the subwoofer turned on, the bass does not start to pick up until about 70 Hz or so, which exactly the spec on the driver. Funny how that works. This is with the subwoofer turned on. 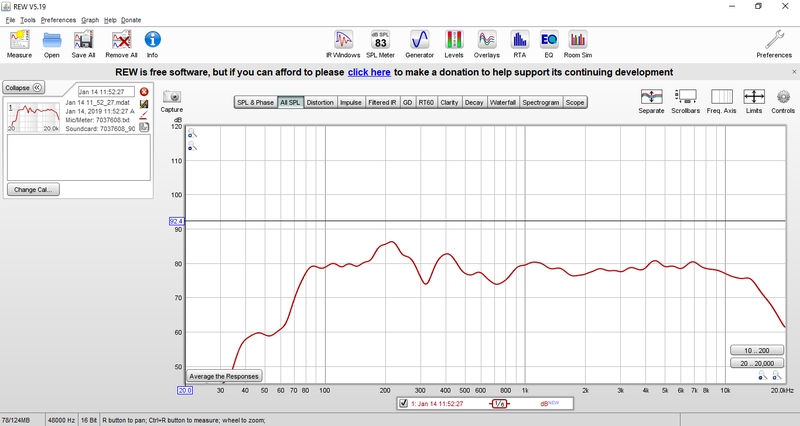 Notice the little hum around 40 Hz, that is the hallway to the bathroom acting as a bass resonator. Unfortunately, my listening room has some uncurable defects; I cannot get rid of the hallway to the bathroom because eventually that room comes in handy. I need to get some acoustical material up on the wall and perhaps the ceiling. I was thinking of a Helmholtz resonator in the wall. My total cost was about $180.00, not counting the materials I already had on hand. After listening to these for several days, I can say they stack up well against speakers that cost ten times what I paid.